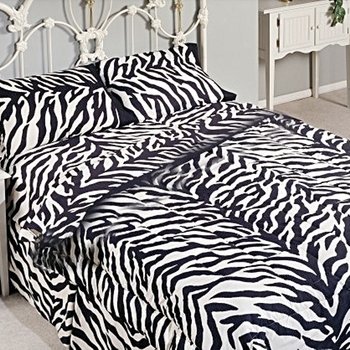 Animal Print Bedding is always popular in both teen bedding and master bedroom ensembles. 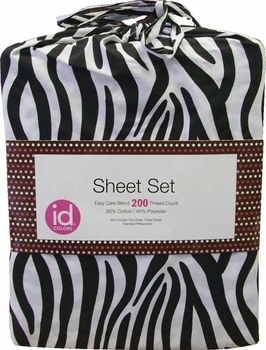 See what all the fun is about with our new and exciting 200 thread count easy care black and white Zebra Print Pillowcases. Cotton rich 60/40 cotton/polyester construction for natural softness with no-iron convenience. 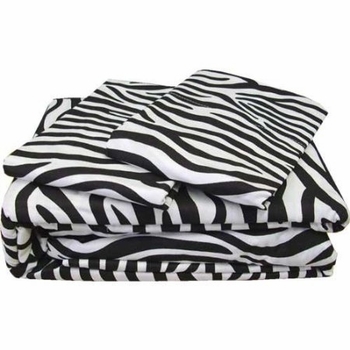 Zebra print pillowcases remain soft and comfortable and retain their vibrant pattern even after repeated washings. Colors are white and black. Our zebra pillowcases are conveniently packed in a reusable fabric drawstring bag made of the same luxurious material as the pillowcase. Pillowcases are packed and sold 2 per package. Machine Washable. Machine wash warm with like colors, gentle cycle. Wash dark colors separately before initial use. Non-chlorine bleach if needed. Tumble dry medium heat, remove promptly from dryer. Warm iron if necessary.